The export file for Xero generated by vintrace matches the Xero import format exactly. Xero have a terrific online guide for importing invoices including field descriptions available here. Please consult the Xero guide in conjunction with this one for a complete reference. In order to ensure invoices generated in vintrace are successfully imported into Xero you must ensure the External Id field for each Item matches the appropriate Account code in Xero. For example if we want the billable Item to impact our “200 – Contract services” account in Xero then we would set the respective Items to have the External Id of 200. Note how we only include the number of the account code here. Please check with your accountant if unsure. The second requirement is to indicate the External Tax Code on the Item within vintrace. This should match exactly the Tax Type within Xero. i.e. GST on Income, No GST etc. Please check with your accountant if unsure. While you can set these for each Item in vintrace, it is possible to set a system-wide default so please contact us here in order to set those for you, letting us know the applicable Tax Type and Account code you wish to use. Using the CSV import in Xero does not auto match any Inventory items you have configured both in Xero and vintrace. This is a Xero limitation and described in there online guide. 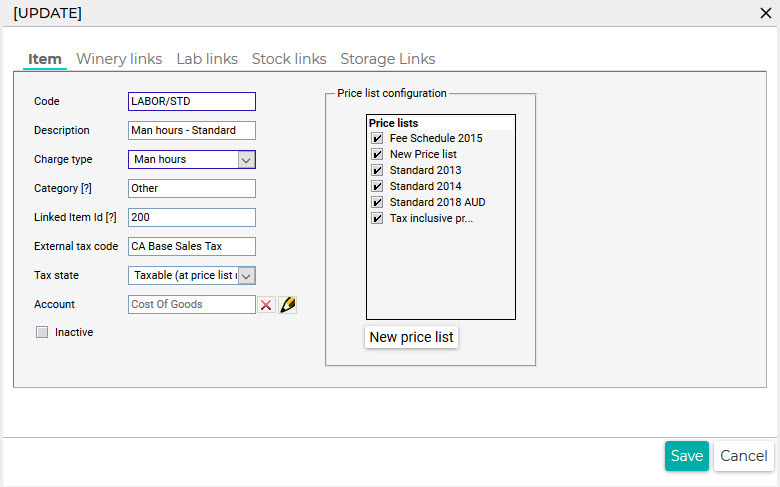 It suggests that you manually select them when reviewing the invoice as it is initially imported in a Draft state. The importer does record the Code of the vintrace item as the Description on the line item for the imported invoices so you have a cross reference. Xero requires a Due date to be set and the default exported from vintrace is 30 days from the date the invoice is created in vintrace. The number of days is configurable via a system setting so please contact support to change. While not mandatory it is advisable to ensure that your client names as configured in vintrace as Owners match closely the customers you have configured in Xero to ensure you don’t end up with redundant database entries. You can use the vintrace Address Book to review your customer names in vintrace. Once you have vintrace configured you can follow the steps to export invoices for a single order here or if you want to export multiple invoices follow the instructions here. In both examples ensure you use the Xero (CSV) format. Save this file to somewhere convenient on your computer. 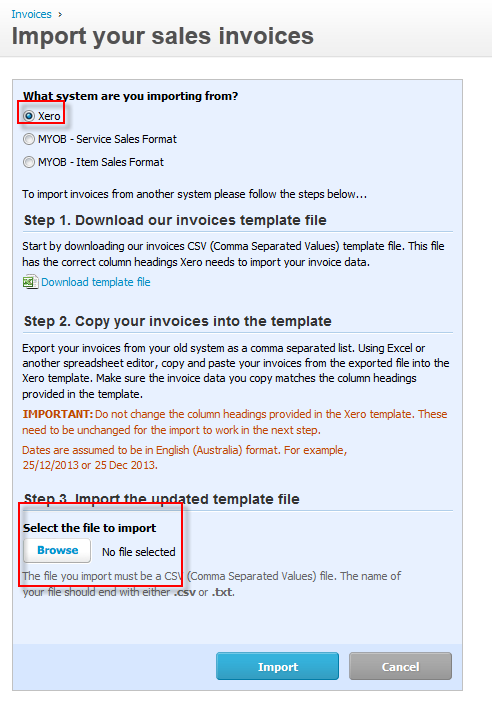 Within Xero select the Import option under Sales. 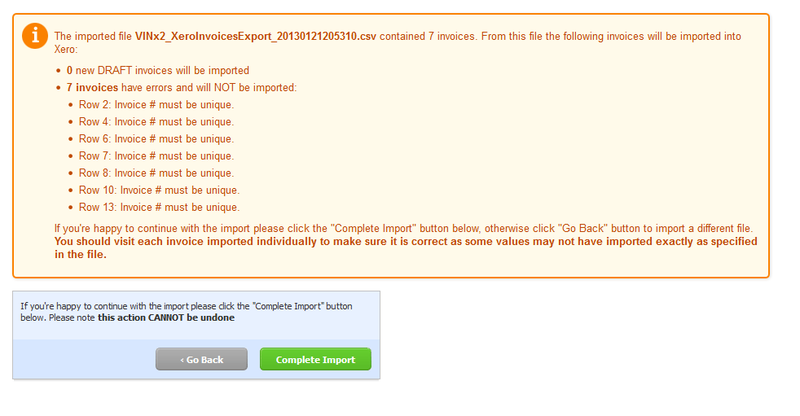 This feature is useful as it will prevent you from accidentally importing the same invoices twice. If the warnings don’t apply, then click Complete Import. Your invoices will now be in Xero as Draft invoices, ready for review and approval.